Jose Mourinho has dismissed reports he could be in line for a sensational return to Real Madrid, insisting he wants to stay at Old Trafford beyond his current deal, which ends in 2020. Madrid boss Julen Lopetegui is under increasing pressure after five games without a win in all competitions, with a 2-1 defeat to Levante on Saturday leaving Los Blancos seventh in LaLiga. Mourinho, who managed the club between 2010-2013, is adamant that he has no interest in taking over should the former Spain boss be sacked, however, and is happy at United. Speaking at his media conference ahead of Tuesday's Champions League clash with Juventus, Mourinho – who's future at United has been the subject of intense speculation in recent weeks – said: "I'm happy here. I'm happy to see my contract out to the very last day and I would like to stay after my contract ends. "All I'm thinking about is Manchester United." Tuesday's Group H meeting with Juve marks just the second time that Cristiano Ronaldo will play at Old Trafford following his departure for Madrid in 2009. 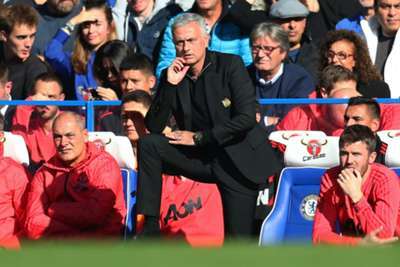 Mourinho, however, was in no mood to talk about individuals, preferring to concentrate on the challenge Massimiliano Allegri's side will pose. "I don't like this press conference," he added. "I don't want to speak about [Paul] Pogba. I don't want to speak about individuals, I don't want to speak to the Spanish journalists because they are only interested in Real Madrid and Cristiano Ronaldo. "I'm going to play against one of the biggest clubs in world, one of the biggest candidates to win the competition - that's what motivates me, that's what brings me here and I think the press conference is going in another direction. So, if it is going in another direction, I also want to go in another direction. "Juventus have a lot to offer. They have an extra year's experience of course with the same coach. For the last five years or so they've been real contenders to win the title."